It’s Donna Hay time again! I am a big fan and I look forward to this event every month. Even when it’s not Donna Day, this blog is peppered with her dishes or dishes inspired by her dishes. Each time another round is over, I check the new host’s blog every other minute until she posts the next theme. Yes, weird and obsessive me. This month’s round is hosted by Helene of the very inspiring blog Tartlette (visit on an empty stomach at your own risk…dessert fiends be warned! 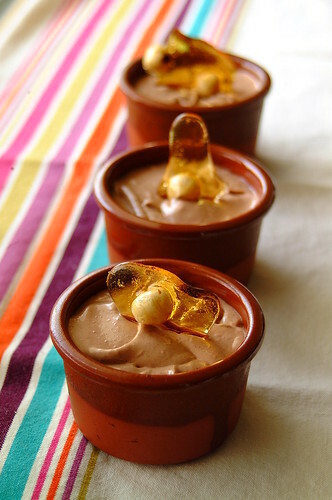 ), and the theme she chose was…mousse! I sat at my laptop a little palm-sweaty. I know this is supposed to be a simple, easy-to-make dessert. I mean, I know it in theory. But I had never made it before (!) so knowing it in practice was a completely different creature. But this is what I like about this event. It always manages to stretch my culinary creativity and sharpen my fledgling kitchen skills. So on goes the thinking cap with mousse in my mind. Kind Helene posted two recipes to spur us on. I mulled and I pondered until I could mull and ponder no more. So with the deadline fast approaching (I think I barely made it) with nary an idea in sight, I realized something which must have been unconsciously guiding me in the kitchen for a while now: When in doubt, Nutella. – Place gelatin in a bowl and sprinkle water over it. Set aside and let the gelatin absorb the water. – Whip cream to medium peaks. – Add Nutella to cream and whip until fully incorporated and fluffy. – Add gelatin mixture and stir well. – Pour into small molds and chill until set (about an hour or two…overnight is even better). **For the hazelnut brittle, I used this recipe from Peabody, substituting hazelnuts for the pumpkin seed. The mousse was light and smooth, like silk on my tongue. Soft, Nutella-flavored silk. I was beside myself! Until I got somewhere midway through the bowl. I don’t know if it’s just me, but I don’t think I can finish much mousse on its own. I think this would benefit perhaps from a thin layer of dark chocolate sponge cake underneath to cut through the mousse-ness of it all. Or maybe some bananas. Mmmm…next time. I used these small clay bowls I bought during our honeymoon in Spain. We got them from La Bisbal, where all this pottery comes from. I’m sure I don’t need to mention that I was dorkily excited to trot these out and use them for the first time! Check out Barbara’s Winos and Foodies to find out more about Hay Hay it’s Donna Day!